Three points and a much better performance but still not quite back to the level that we saw up until the end of October so this is one that leaves mixed emotions, as it was not quite the resounding start to 2018 that we were hoping for. 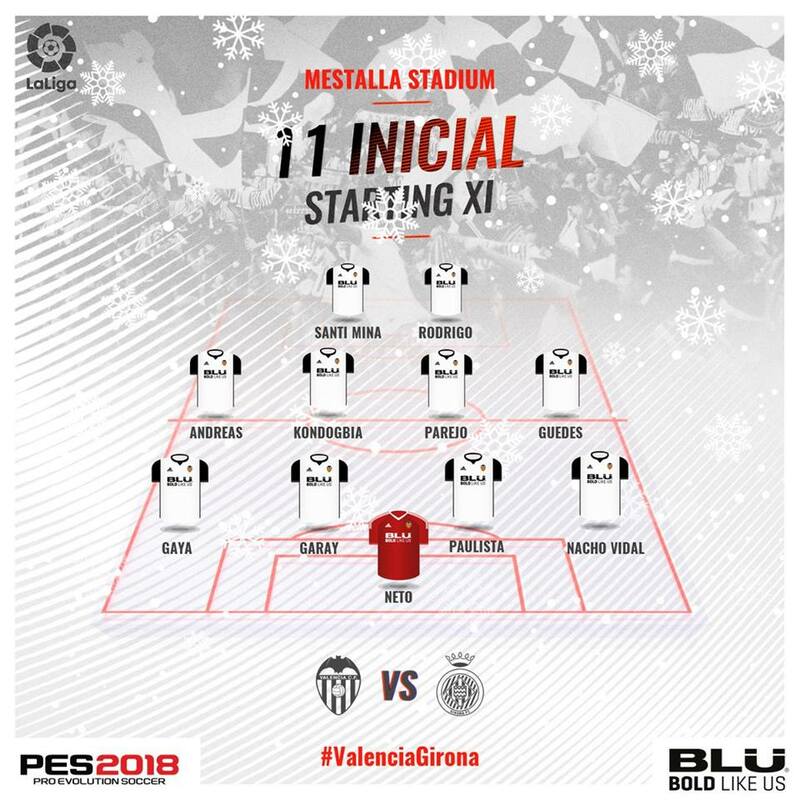 With Montoya and Zaza suspended, Nacho Vidal and Mina got a start and a chance to stake their place for a claim in the starting line-up, which neither would take. Apart from that, Gabriel being preferred instead of Vezo was the only other selection of note. The opening part saw both teams have chances. Neto saved low down from a corner, while Guedes had a shot just wide. Poor defending saw Girona take the lead. Both Vidal and Pereira were unable to handle Mojica in the corner and neither Garay nor Gabriel picked up the former Valencianista Portu who planted a header past an all-too-static Neto. A poor goal to concede and the sensation was reminiscent of last season's Valencia rather than the one that had an eight-game winning streak this season. Luckily, the goal galvanised Valencia, who dominated the half after that. Gayà and Guedes proved a particular threat, linking up well on the left and it was from that side that the equaliser came. Mina found Guedes, who dribbled well on the left to create space. His attempted centre would have probably gone wide, but the defender deflected it past the keeper to give us a deserved leveller. 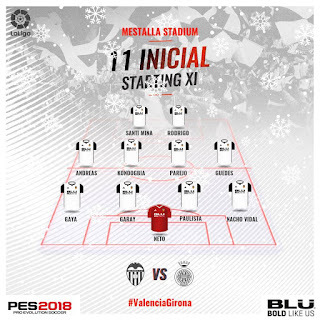 Valencia should have been ahead before half-time. Firstly, a good header from Paulista was saved well, then Rodrigo was denied a clear penalty after being fouled by the keeper. Just before the half ended, Guedes got clear on the by-line but was unable to find our forwards with the pull-back. Having deserved to be ahead at half-time, Valencia took the lead just after half-time and the decision also looked questionable. Gayà had made a great run to the by-line and was fouled, but it looked like he was outside the field of play when fouled, which should have been a drop-ball and possible caution for the defender under the rules. The decisions evened out, but it would be best if these refs just got it right first time. Parejo slotted home for what would prove to be the winner. While Girona made more effort after that, it was Valencia that would have deserved a fourth goal of the game more. Guedes broke and found Rodrigo for a half chance in the 52nd minute, but the latter dragged his shot wide. Shortly after that, it was Rodrigo who turned provider, latching on to Mina's header and centring the ball back for Mina, who was just unable to get on the end of it. Girona also had their chance, Mojica forcing a good save from Neto at his near post and later, Stuani's header being saved well in similar fashion. Despite all that, it was Valencia who still looked the more likely to add a goal, though it was not to be. Rodrigo and subs Maksimovic and Vietto were all unable to score half chances to put the game to bed and a scrappy climax ended with Valencia running out winners. Girona have shown themselves to be no pushovers this season and are a top ten side for a reason, but this game highlighted the fact that more effort is needed to maintain us in our current position. Vidal 4.5 - has been one of the season's biggest letdowns. Began the season as a player tipped for better things but below par performances have pushed him out of the running. Got owned today and it was no surprise to see him subbed off.